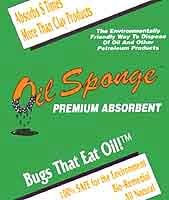 Oil Sponge is an absorbent for the encapsulation and bioremediation of oils, greases, fats and petroleum. PHase III Inc. Environmental Products, 916 E. Baseline Rd #101, Mesa, AZ 85204. Tel: 480-503-2847; Fax: 480-503-1077.